OMG!! Is THIS the ultimate algorithmic Fingerpicking Machine?!? One of my most persistent musical fascinations has for many decades been solo guitar instrumentals, mostly of the so-called "primitive" fingerpicking sort, and I've been on the hunt from the very start of my computer-aided music journey, also decades long, for the most useful apps, samples, plugins, scripts, arps, insights, etc. that would really let me play deeply with the genre, virtually. Frankly, it's been pretty slow going, but recently (last few years) things seemed to be looking up a bit. For this brand-new user, the presence of built-in Fingerpicking Generators in RC was a hugely promising discovery…but a few weeks of faffing about with those presets and randomized versions wasn't really doing it for me. Not at all bad, but not all that apparently flexible, nor any really sounding to me like what I hear in my head with that Fingerp. term. Still, I was getting editable stuff, about as much as I'd really hoped for with a phrase-patterning device, as I saw RC to be. Oh, but no!! Ostinato patterns…and VARIATIONS!! Especially the ones called Velocity Generator, Accents 4ths/8ths/16ths, and MIDI Echo. These are astonishing—far and away the most subtle and artful parameter adjusters I've EVER encountered—for ANY sort of MIDI-sequence tweaking! The tiniest shifts on the multiple sliders they offer, esp. when all are in play at once, massaging any already intriguing note pattern (even from the FP Gen., tho I get best results so far from the Ost. Gen.) rolling over simple chords, can skyrocket the sculptor completely away from anything mechanical, robotic, coarsely-adjustable-only, and sequenced-sounding. IMO, of course, but show me something better! I've never even come close to anything like this. And it didn't cost $699+ like so many other MIDI and audio tools that grace those way-high-up shelves of the truly Pro and Supposedly Magical "Studio" tools. So, here's a fast taste of what did it for me, rendered out after less than an hour of ever-more marveling efforts, when I first stumbled onto this level of RC. There's not a single MIDI pitch, level, or timing event moved or even touched in any other program, and no single pitches even tweaked in RC, just varied phrases, all sent just as created with RC's knobs and menus out to Omnisphere in Logic, via the Mac's IAC driver. (Using the built-in soundfont instruments in RC were seriously bogging it down as I tried to slide sliders in RT during playback, but with the audio handled elsewhere, smoooooth sailing on my 4-year-old iMac 27in.) So THAT's the tip here, btw, along with the varied ostinatos stuff above. Attila and team, I'm yours, forever—THANK YOU!! Last edited by David on Sun Feb 03, 2019 8:41 pm, edited 1 time in total. Re: OMG!! Is THIS the ultimate algorithmic Fingerpicking Machine?!? Whoops. Forget that comment if you saw it. I only just realised this is an advertisement. My bad. thank you for posting your tip. The Fingerpicking Generator is very old, and needs some redesign. It was one of the first attempts, I am not proud of it... But fortunately there are creative people who overcome limitations. an-electric-heart: this post was definitely not an advertisement! Discovered even easier path to what I seek (easy, fast fingerpicking simulation with lots of room for pattern play and always tied to the orderly structures of chord progressions, also easily played with, basically a capsule explanation of what RC offers to beginner users). …and second, to then create a second track (or more), all set to the same MIDI Channel so my target plugin (Omnisphere in Logic via the Mac's IAC driver) would see the data from both/all, and fill at least one of these added tracks with a Melody generator. This way the looping-pattern track(s) handle the entire FP-icking illusion and the melody track supplies the melodic variations right on top of the loops, and if not too rhythmically or volume-wise different from the looping patterns, sounds like they're both one performance, rather than an accompaniment or duet. Works quite well for me anyway. In the first of three examples below, I dragged in one clip, then staggered it across three tracks all on channel 1, so I could assign different track variations to the same clip, then added a single melody track, as you can see in the image above. In the second two examples, I used a single pasted-MIDI-patterns track, but dragged in and arranged two different saved clips, then dropped in some different phrases/gens to create variety and relief…then added and stretched out long melody-gens on a second track, then added Variations, both to the tracks and to several of the phrases. Remarkable! Can't wait to try this out. Further adventures in virtual fingerstyling with the wondrous Omnisphere/Zimmer "Flamenco" guitar, doing quite a respectable job, I think, of being both guitarish and harpish, or at least credibly nylon-stringistic. This time the tools are the ravishing Phrase Container (filled here with a handful of maximum-ly slowed-down Strummer Generator presets) and the even more tremble-making Phrase Morpher (here shifting between a Melody Gen and a Dyad runner with a Strum variation, plus plenty of Ostinato-ing as per usual). RC simply grows ever more essential and more revelatory—THANK you! Nice! 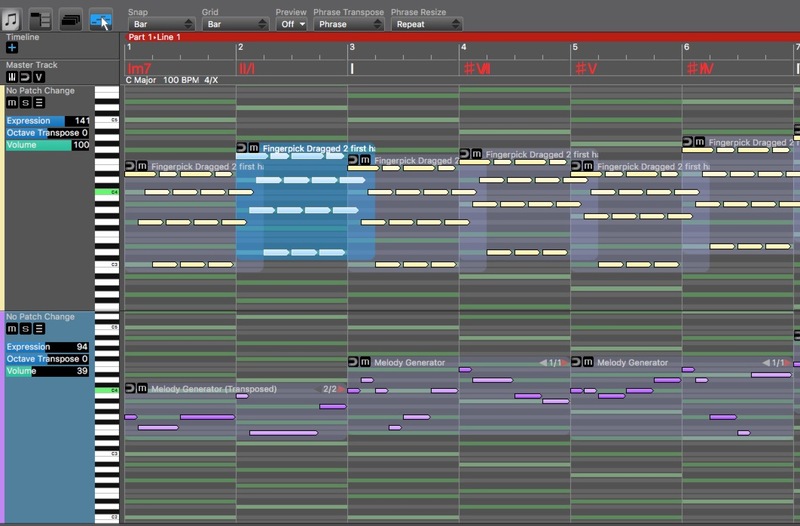 I am so happy when I see someone using RapidComposer with such high proficiency. very cool David! Yea I am planning on getting the "ladies" library from Realitone.. Oh the fun.. lol Keep it up, love seeing the what people can do with RC too..
David, are you also on the Reaktor forum?